I'm on my sixth year of doing Elementary School Science Projects, and by now I feel like quite a pro. We had some great ones this year. First, my kindergartener and I put different liquids in an ice cube tray to see which ones froze the fastest. My third grader wanted to build an electric motor. I was skeptical about this, but my husband said he would head up the project. They found some great plans on the internet, and do you know what? The darn thing works! For a long time I wanted a nice wooden music stand to go with my harp. The rickety collapsible metal one I used just didn't seem to match it, and besides, my sons liked to take off the top part, fold it so that it looked like a crossbow, and then run around the house playing with it. Very clever of them, but not so good for the old music stand. I took a risk and ordered this one from Amazon.com. The wooden music stands at the piano store were all over $100, so this one was a steal at $40. It was too red, so I got out my can of dark walnut wood stain and put a darker coat on it. Now it looks very nice. The timing was impeccable. The very day I brought the new stand in from the garage, wood stain all cured, the boys brought me the old metal stand with one leg broken off. I guess they'd been trying to fold it to look like a rocket launcher or something. Late last night my printer jammed. I was trying to print out morning work checklists for my children. I don't like to micro-manage, but for my sanity, I hand out a checklist so that I don't have four people asking me ten times each, "Mom, can I play on the computer YET?" I need my sanity. I had to have those checklists. The paper jam was somewhere deep within the machine where I couldn't see. After an hour of trying everything I could think of, short of getting the screwdriver, I started looking for the instruction manual. This means I am only moderately geeky, since I will only mess with a machine for a mere hour before resorting to the instruction manual. A true geek would have gone for the screwdriver first. As I took out the instruction manual, its sheer size made me hopeful. Surely a manual of this magnitude would have some helpful information in it. My hopes were dashed when I saw that the English instructions ended abruptly on page seven and the rest of the book was taken up by duplicate instructions in French, Spanish, German, Japanese and Tagalog. On the last English page, under the heading "paper jam," the book referred me to the on-line help site. On LINE? I had to go on line to get help? I trudged upstairs. Our downstairs computer, where the printer is, has a slow and unreliable dial-up. Upstairs, the lap top computer can pick up a wireless signal if I balance it on the hamper in the master bathroom. After balancing the lap top and typing in the address for the on-line help site I found a FAQ about paper jams. It said that the back panel of the printer could be removed by pressing a certain lever. WHY DIDN'T THE INSTRUCTION MANUAL SAY THAT? I ran downstairs, took off the back panel, and lo, the paper jam! I pulled out as much of the paper as I could, but a tiny piece was still wedged tight in the gears that turned the back rollers. I tried a sewing needle, a fork, and a bamboo skewer, all to no avail. Stuck again, I went back up the stairs. After reading the FAQ over and over, I stared for a while at the button at the bottom of the page that said, "Chat with live tech support." What could tech support tell me that I didn't already know? Should I just get the screwdriver? No, if I broke the printer I would never be able to print out those lists. I clicked on the button and registered for the chat. That was a little creepy, I must admit. Yes, I had typed in my name when I registered for the chat, but now some stranger was addressing me: some stranger who works swing shift doing live tech support chat with people who are trying to print things in the middle of the night. I described my problem as best I could in a few lines. Live tech support came back with, "I regret the inconvenience that has been caused to you." Oh dang, I thought. English is not your native language, is it? I wasn't sure I could get a native English speaker to understand me, what chance did I have with this person? Then again, maybe it would work. Maybe he could look up what I had typed in his English-Tagalog dictionary while I ran up and down the stairs between my printer and my on-line computer. First, live tech support sent me the FAQ I had already seen. I told him I had already read that FAQ and removed all of the paper except one little bit that was stuck fast in the gears. "If we could get the rollers to move somehow," I typed, "I think the bit of paper would fall out." "Yes, you can turn the rollers up." said live tech support. I ran downstairs to try it. Earlier I hadn't been sure whether trying too hard to turn the rollers would break the machine. Now that I knew that they were supposed to turn, I got my fingers in there and pried and twisted with all my might. The scrap of paper put up a good fight, but at last the gears began to turn and the paper popped right out. Back upstairs, I typed, "It WORKED! HOORAY" I think live tech support was happy for me. He stayed on until I had actually printed a page, then wished me a happy holidays and a happy new year. . . on January 13th. He can't have been an American, but I felt like he was my friend anyhow. And, this morning, I had the checklists. I am sure that I am more grateful for live tech support chat than my children are. Dr. Carlson in the News! Russel's class got filmed for a local TV news spot. If I'd known they were going to send a TV camera that day I might have insisted he wear a collared shirt. Oh well. He doesn't always wear a T-shirt to class, really! Maybe they wanted it to look like we were suffering so much from the budget cuts our teachers couldn't afford to dress up for class. My two-year old asked for a drink of water. To those of you who have never had a two-year old, I must say that you can have no idea what this entails. It sounds simple and straightforward, right? Get a cup, fill it with water, give it to the child. I try that. I get a cup and fill it with water and offer it to the child. My act of kind service is met with fury and tears. "NO! YELLOW CUP! YELLOW CUP!" Apparently, the child wants water in the yellow cup. "Ask mommy politely," I insist. The toddler pouts and looks at me pleadingly. "Say, please may I have water in a yellow cup." I prompt. "Pease (mumble mumble mumble)" he says, very contrite. So I get a yellow cup from the cupboard and fill it with water. More fury and tears, "NO!!! ORANGE JUICE! ORANGE JUICE!" "Ask mommy politely," I insist again. "Say, please may I have some orange juice?" "Pease may I orange juice?" Now I open the refrigerator and get out the orange juice. I pour half a cup into the YELLOW cup and hand it to the two-year old. All seems to be well. I pick up my address book and start looking up the phone number of a friend who just had a baby. I want to call and congratulate her. The two year old is screaming because he dropped his orange juice. Very calmly and sympathetically, I say, "Too bad. You spilled. That's okay. I'll clean it up." There is a pink hand towel from yesterday's laundry lying on the floor, conveniently near by. I mop up the orange juice and go back to the phone book. "Stop crying and ask mommy politely." "Okay," the two-year old sniffles, "Okay." After a long pause, I prompt, "Say, please may I have some more orange juice?" Once again, I fill the cup. Once again, I look down at my phone book. I'm getting close, I'm on the right page. This has nothing to do with orange juice. This is some kind of scientific experiment. The child wants to know how many times he can persuade me to give him orange juice when all he wants to do is drop it on the tile. This time I clean it up in perfect silence. Once again, I make him ask politely. As before, I half fill the yellow cup. This time, however, I watch him like a hawk, daring him to drop the cup on the floor right in front of my eyes. He drinks the orange juice. "More juice! More juice!" As soon as it is gone he wants more, of course. "Say, please may I have more orange juice?" "Please uh may I juice?" Good enough. I pour him some more, but this time he just holds the cup and watches me. The two-year old turns and starts walking away with his cup. "Drink your juice or I'll have to put you in your chair until you finish it," I warn. "Drink it," I start after him. "NO! NO! NO!" he is hopping up and down, nearly sloshing orange juice out on his shirt. "Wanna sit chair." He starts pulling the step stool across the floor towards the sink, barely balancing the orange juice upright in his other hand. At this point the phone rings. I go and get it. When I come back, I see that the child has dumped his orange juice in the sink. I take the cup. "I wa' orange juice!" he demands. "Forget it." I say. "If you're thirsty, you can have water." I decide not to call my friend to congratulate her on her new baby until later, so she won't have to listen to my child screaming in the background. It would be just too ironic. I finally turned the alarm clock on again last night. In my opinion, alarm clocks, like coffee, are cruel instruments of sleep deprivation. If you get to bed early enough, you shouldn't need them to wake up in the morning. Ideals are all very well until you have a five year old that must be gotten up at two a.m. for a visit to the potty and a two year old who crawls in bed with you and pulls your hair around three a.m. every single night. So, after resisting for several months, I am back to relying on the alarm clock. Early in our married life, we had the alarm set to turn on NPR every morning. That worked only moderately well because we liked to lie there and listen to the news, and then even after we turned it off we would lie there and TALK about the news. It took a half hour to get going! Then I decided to switch to a Spanish speaking radio station. Nothing like a loud Hispanic polka to get me leaping out of bed to hit the "off" button as fast as possible! When that grew tiresome I tried tuning the dial between stations so that I'd get a loud, jarring, static buzz to jerk me out of my dreams. Last night I realized that I might as well flip the switch from "wake to radio" to "wake to alarm." So this morning at ten till five I woke terrified that the house was on fire, until I remembered that I had set the alarm. Nothing like a little alarm clock induced adrenaline to get you going in the morning. Greetings and welcome to 2008! Today I stuffed all the old Christmas decorations (plus some new ones I bought yesterday at K-Mart for 75% off) up in the loft over the garage where they will wait for another year to roll around. Take time for scripture study and prayer every day as a family in the morning, on my own during the day, and with my husband in the evening. 1. Show my children they are more important to me than my housework, hobbies and recreational pursuits by STOPPING what I am doing and giving them my full attention when they ask for it. 2. Expect more respect, show more respect. Remodel the upstairs bathroom and install a drip irrigation system in the front yard. Finish writing my second novel and go to the BYU Writing and Illustrating for Children conference. Finish interviewing my grandmother for her life history and catch up on printing out my photo-journal. Constant maintenance will replace emergency disaster relief. 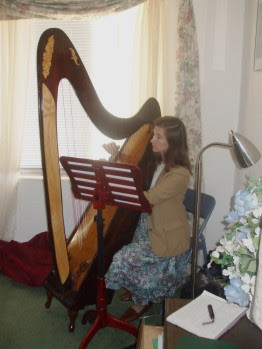 Memorize some new songs on the harp, practice the piano a little every day, and transcribe and arrange some more harp music out of the Edward Bunting "Ancient Music of Ireland" book. Oh, and build another 29 string harp! There, that should keep me busy for a year!